Only three teams came away from the Etihad Stadium with their pride fully intact last season; and remarkably, little old Huddersfield Town was one of them. Scrambling for survival in early May, David Wagner’s minnows played the role of party poopers, fighting tooth and nail for a brave, and as it transpired, precious point on the day Man City lifted the Premier League trophy. Refusing to park the bus, playing a brand of well-organised but tenacious football, the Terriers were fantastic. Limiting Pep Guardiola’s superstars to just two shots on target, they fully deserved the goalless draw. So they return to the home of the champions this Sunday as underdogs with the knowledge and experience of how to cope with City. Can they somehow replicate that performance? The best football betting sites don’t think so, so you can get a price of 28/1 about another 0-0 draw with Ladbrokes. Where Will Goals Come From? If last weekend’s smooth 2-0 success at the Emirates Stadium was Manchester City in a state of under-prepared rustiness, then the rest of the 19 Premier League teams may as well give up already. Playing with exceptional brightness, keeping a pumped-up Arsenal at arm’s length with relative ease, they were mightily impressive. Leroy Sane, David Silva, Gabriel Jesus, Vincent Kompany and Kevin de Bruyne all practically sat out the opening day too, which is altogether frightening. A knee injury picked up by De Bruyne in training is naturally a serious blow for Guardiola, but he isn’t short of adequate stand-ins. Bernardo Silva was exceptional last Sunday and could now get an extended run in the team, and the summer addition of Riyad Mahrez also gives the Spanish head coach another option. The gifted Algerian was confident on debut, almost scoring twice. Mahrez bagged a goal for Leicester City at home to Huddersfield last season, and might be a shrewd gamble to score anytime on his first home outing in a City shirt. Never shy of having a crack at goal with his wondrous left foot, Mahrez is even-money to score at anytime with BetBright. While we are on the subject of goalscorers, it is hard to see Raheem Sterling being rested by his manager on the back of his starring role on match day one. Razor sharp and full of wing wizardry, Sterling led the Gunners defence a merry dance and I’d back him to do it again when the Terriers come to town. Clearly in-form I’d suggest Sterling is a decent tip at 7-2 to score first on Sunday with Ladbrokes. We Didn’t Forget Aguero. . . Neither Gabriel Jesus or Sergio Agüero took the World Cup by storm this summer, which may rankle a little, but with their in-house rivalry resuming, I expect both strikers to bring their A-game when opportunity knocks in the early weeks. Based on last season’s stats, Agüero is still the front man to favour when you’re looking at the scorer markets. He found the back of the net once every 93.8 minutes during 2017-18, compared to 128.5 minutes for the brilliant Brazilian. The Argentine outscored his fellow South American 21-13, but that did include four Agüero penalties. It feels as if Guardiola has made him first choice now, and after drawing blanks on the opening weekend it feels almost nailed on that Agüero will get off the mark on Sunday. Therefore, Agüero to score at least two goals at 11/8 with Coral, makes appeal. While it’s nice for us neutrals to imagine an epic shock occurring at the Etihad; when realism sets in you know deep down it’s fanciful thinking. David Wagner’s men were poor on the road last season, scoring just 12 away goals, and based on a fairly ineffectual display at home to Chelsea you shouldn't rush to back them here. While a frankly outrageous 30/1 on Huddersfield win can be found at 888Sport, I don’t see that ambitious gamble paying out. Instead I’d be looking for specific score lines or outcomes to provide value when betting on this contest. Eager to impress their boss with competition for places so fierce, I envisage a relentless attacking performance from Manchester City. 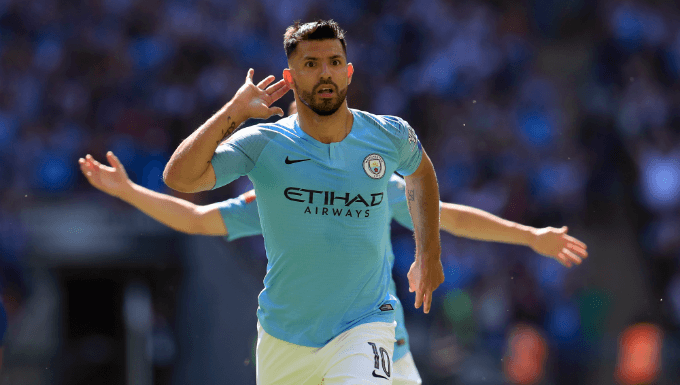 Two standout choices are Agüero to score in a 4-0 victory at 17/2 (888Sport), and City to win by four goals or more at 8/5, which is on offer with Sport Nation Bet.